Because of all the questions and arguments regarding the Certificate of Compliance (CoC) for electrical installations, the ECA has prepared this series of articles to clarify the requirements strictly in terms of the legal requirements. SANS 10142-1:2017, Edition 2.0 The wiring of premises Part 1: Low-voltage installations. All these documents are available in the public domain, the first two from the ECA website, http://ecasa.co.za at no cost to members. SABS 10142-1 is available directly from the SABS or via the offices of the ECA. In this part we will continue with the detailed discussion of the inspection aspect of completion of the CoC. Bear in mind that, while it may seem trivial to write a response as simple as “yes” into a space, this is very onerous as there are various aspects and requirements to consider. The essence of this item is to ensure that there are adequate and secure means of making safe an appliance or a part of an installation for the purpose of working on it with safety, and to ensure that it cannot be inadvertently switched on by others, causing injury, death or fire. Every aspect of these requirements applies for new installations. For existing installations, where the certificate is issued in terms of the basic safety principles and reasonable safety, you will have to decide what will not significantly improve safety. 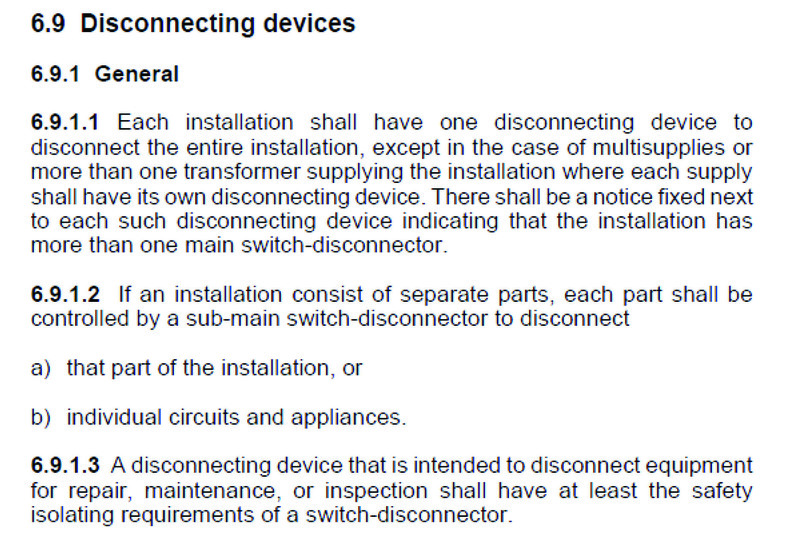 The detailed requirements for disconnecting devices are set out in sub-clause 6.9. You are never allowed to break the neutral conductor without also breaking the associated live conductor at the same time. For a single-phase appliance, both live and neutral must be interrupted simultaneously, but in a 3-phase or multi-phase, only the phases need be interrupted. Note that you may interrupt the neutral as well but ensure that it is never interrupted while any of the phases are not. 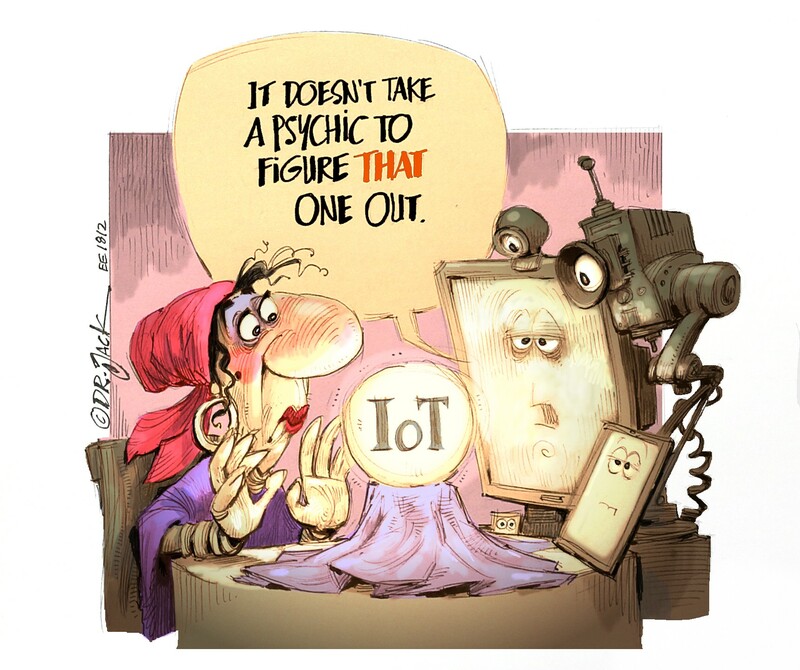 Even momentary energisation of phases without a secure neutral connection generally results in overvoltages in single-phase circuits which, in turn, causes expensive failures of single-phase equipment. 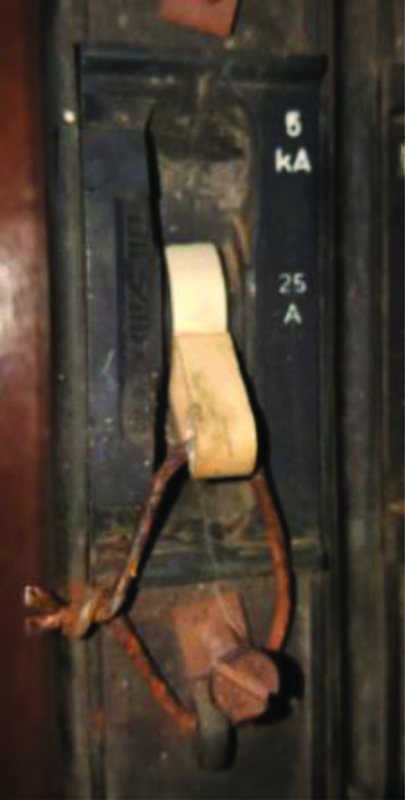 As we’ll see later, disconnection can be achieved by removing a plug from a socket, a lockable or readily-accessible switch disconnector. Following are some examples of the lockable/locked possibilities and the subject of much debate. Any of these will prevent the inadvertent switching-on while someone is at risk. 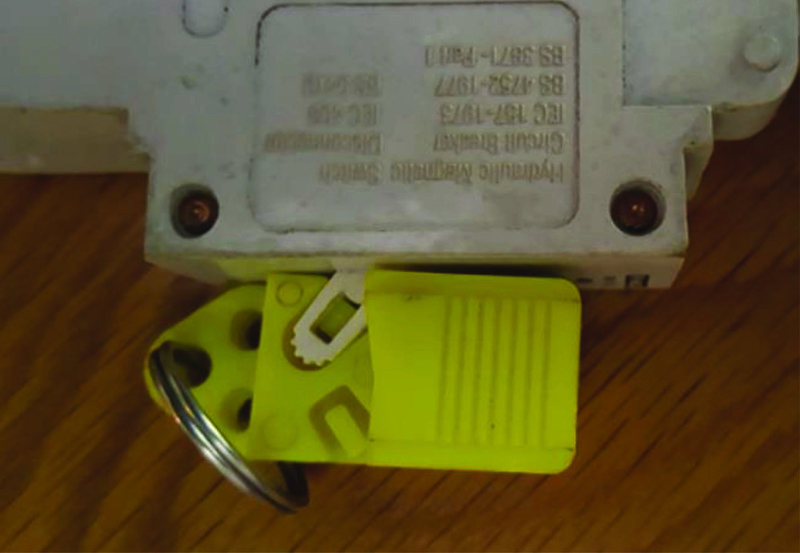 A keyring has been used for illustration purposes, but up to three padlocks can be used simultaneously; three different persons can lock out the same circuit and it can only be switched back on once all three have released their locks. Each DB must have its own Main or local switch disconnector. However, where two adjacent enclosures are used to form a single DB, a common switch disconnector may be used, provided it is apparent and suitably marked. General requirements for all appliances are given here. Specific requirements for types of appliance differ and override these general requirements. 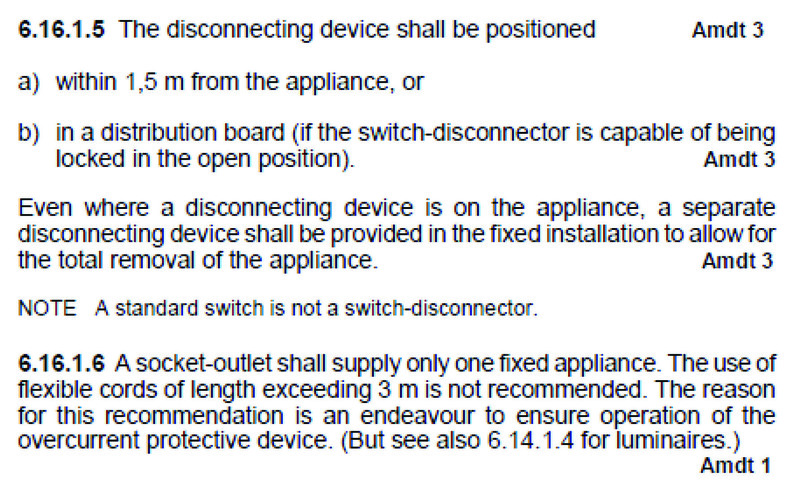 There are no additional requirements to 6.16.1 for the positioning of isolators for geysers, so it can be within 1,5 m from the appliance (actually, within 1,5 m from the supply terminals would be preferable) or it may be on the DB, provided it is lockable. When issuing CoCs for some older installations, particularly smaller flats, we often find geysers installed above the bathtub inside Zone 1. In these instances, isolation from the DB suffices, and installing an isolator in the bathroom is not recommended or required as it causes increased risk. 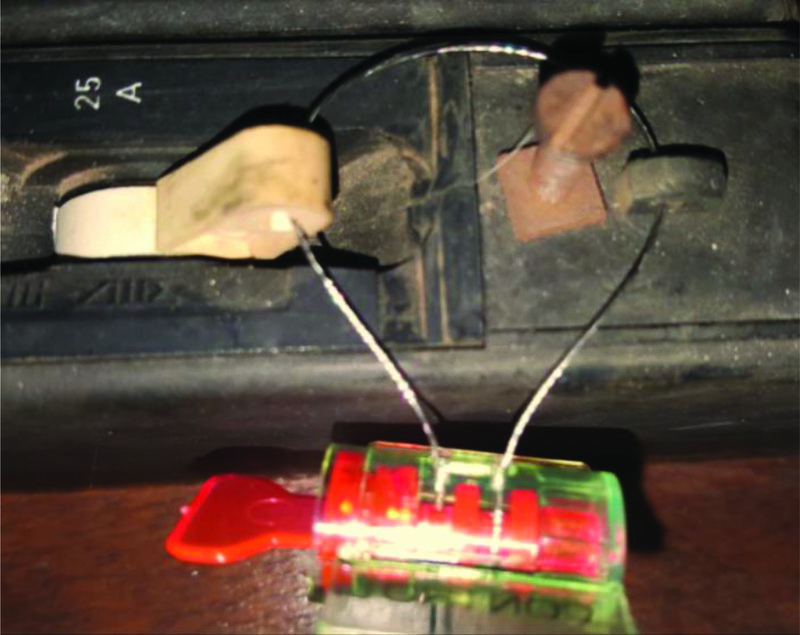 Also ensure that any current-carrying parts are enclosed (ensure that the cover over the terminals are securely fixed). For new installations, it must be protected by earth leakage. This is recommended for all such instances. For stoves and ovens, the isolator must be within 500 mm (3 m if labelled clearly) of the appliance, in the same room, and between 0,5 and 2,2 m from the floor. This is because it must be possible to switch the supply off immediately in case of a grease fire. The isolator should also not be above the hob, for the same reason. While these may be supplied via socket outlets, this is not the best practice. 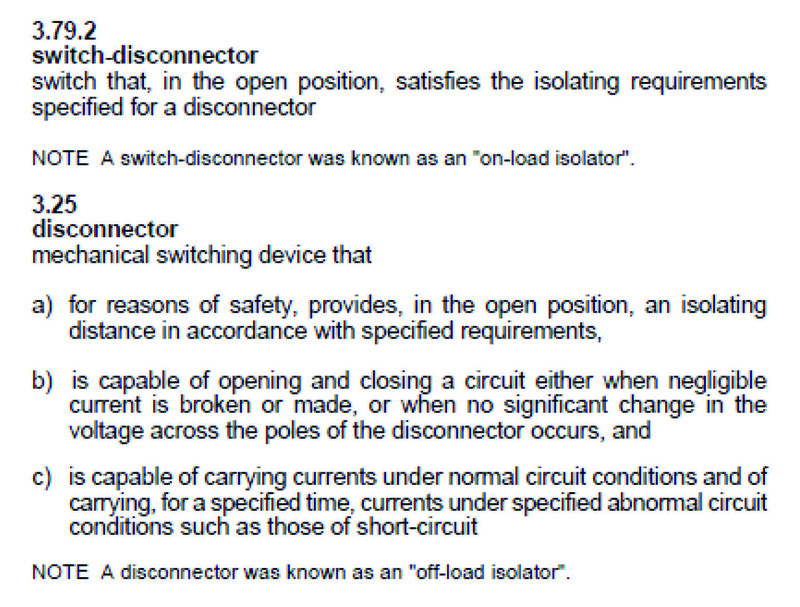 For existing installations, a connection via a socket is not by itself contrary to the basic safety principles or reasonable safety, so, provided all other requirements are met, this need not prevent the issuing of a CoC. 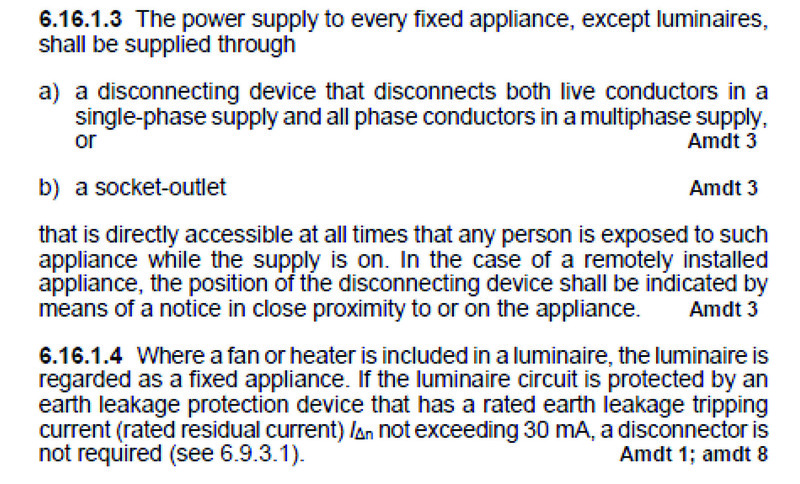 Any unit rated at more than 16 A shall be on its own (specific aircon) circuit, but more than one may share a circuit. However, each must have its own isolator. Homeowners’ desire to install heated towel rails above baths in zone 1, or within reach from inside the bath in zone 2, causes much confusion, particularly as far as isolation is concerned. The same rules as for water heaters or geysers apply, but option B2, of using a class II (double insulated) appliance instead is added. Fig. 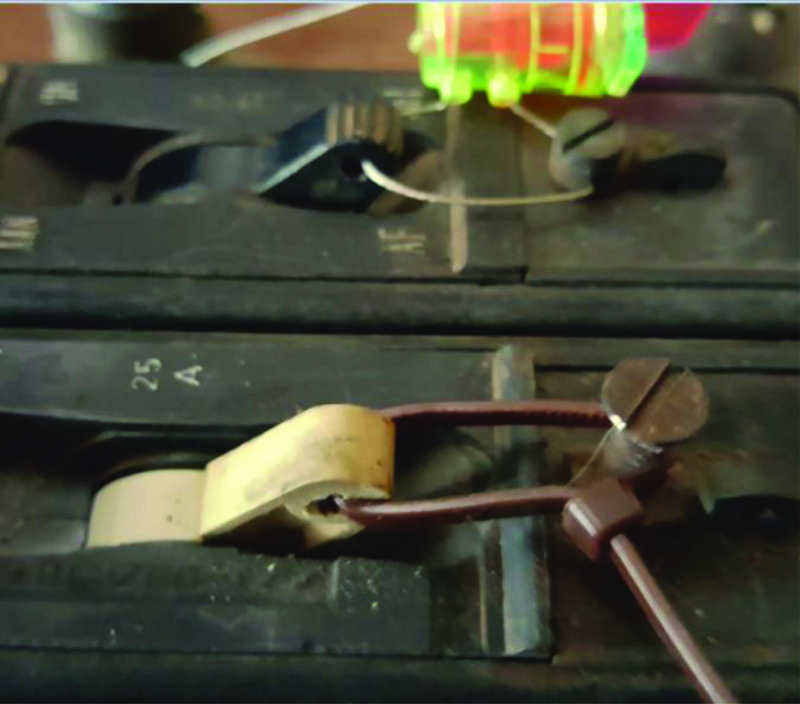 17 shows an unconventional way to secure a meter box or distribution board without a padlock. It can’t be released inadvertently and requires a tool to open. This part deals with appliances in which live electrodes are immersed directly into water, and current is passed through the water to heat it. There are, of course, many risks involved here, which is why specific additional requirements are prescribed. 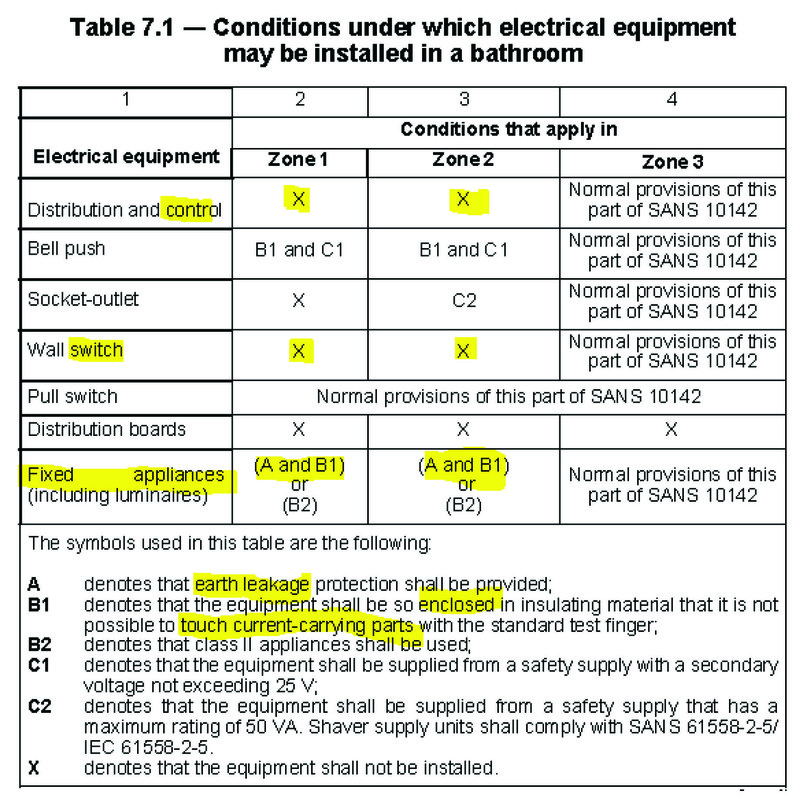 Only once you have satisfied yourself that, for each appliance and DB throughout the installation, the disconnecting devices break the phase conductors including the neutral in single-phase installations, and that each is located correctly as described above, may you enter “Yes” in the appropriate space on the CoC. Remember that the main purpose of isolation is to ensure that there are secure means of disconnection to safeguard persons working on the installation and appliances.